This edition of the Tide of Iron core set replaces to large box, Fantasy Flight edition. The main differences between to the two editions are Next Wave will have reformatted rules and quick-start scenarios to better facilitate new players' entry into the game, slightly reduced components (15 less miniatures 225 vs 240, and less dice 14 vs 20). No rules have been changed and this new core set remains compatible with ALL previously published materials from both Fantasy Flight and 1A Games. Tide of Iron is back, but will 1A Games' Next Wave live up to Fantasy Flight Games' proud tradition of producing this WWII game of tactical battles? Cody investigates. 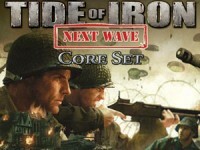 Add a Review for "Tide of Iron: Next Wave"